April 30 to May 2, 2019 9:00 A.M. to 3:00 P.M.
May 13 to 15, 2019 9:00 A.M. to 3:00 P.M.
May 28 to 30, 2019 9:00 A.M. to 3:00 P.M.
Stay for the third ‘coaching day’ to stat shaping a first-year plan and budget to launch a drone business or a division of drone services. Learn funding opportunities to set yourself, and your community, up for success! April 25, 2019 9:00 A.M. to 3:00 P.M. FREE! Get inspired and informed about opportunities coming to your community! Learn the basics of the new drone regulations, new Pilot Operations Certificate programs, and job and business opportunities near you. Learn how to assess what your community or entrepreneurs may need for budgets, technologies, training, permits, and insurance to effectively launch or expand your own drone business or drone department! Opportunities in the rapidly growing drone ecosystem: companies, governments and researchers are using drones now...do you want to do the work or let others do the work in your territories? Ways that Transport Canada’s drone-aviation regulations and new requirements for Certified Pilots and compliant equipment have a huge impact on everyone considering or using drones…yet provide opportunities to do #GoodDroneWor. Budgets! What are common start up costs for training, Certification, choosing the right aircraft and payloads, and setting up a compliant operation (insurance, safety procedures, etc.). What are industry events or associations to consider, and how do you market your drone ‘idea’ effectively? Why Indigenous entrepreneurs, joint ventures and leadership are positioned to lead the field if they get people trained, Certified, equipped and prepared to move forward now. Contribute to a strategic roadmap to build your community’s capacity to launch new businesses, support more post-secondary students, get dynamic jobs, and consider innovative joint ventures and research projects. 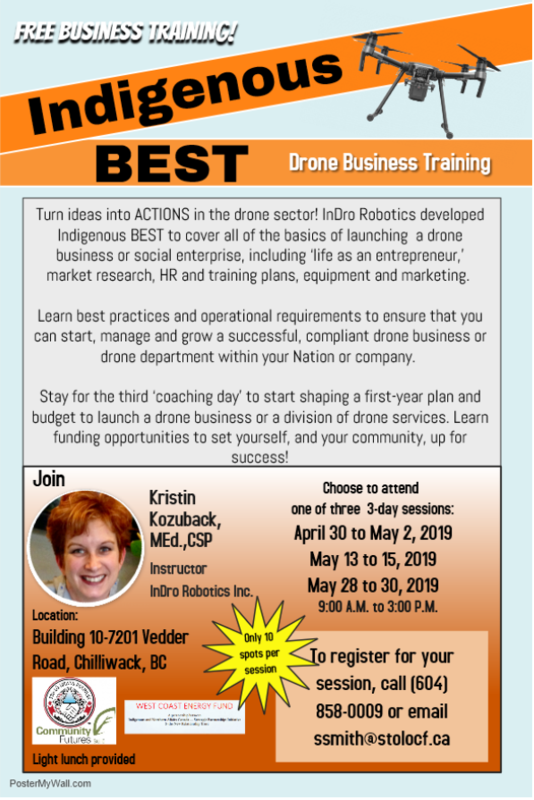 Then consider signing up for the Indigenous Drone BEST Program (Business and Entrepreneurship Skills Training) Programs - and get ready to do #GoodDroneWork soon!